Several shades of gold shimmer from dark to light, metallic to rose, depending on the way the sun hits the new Ngoolark Student Services building. 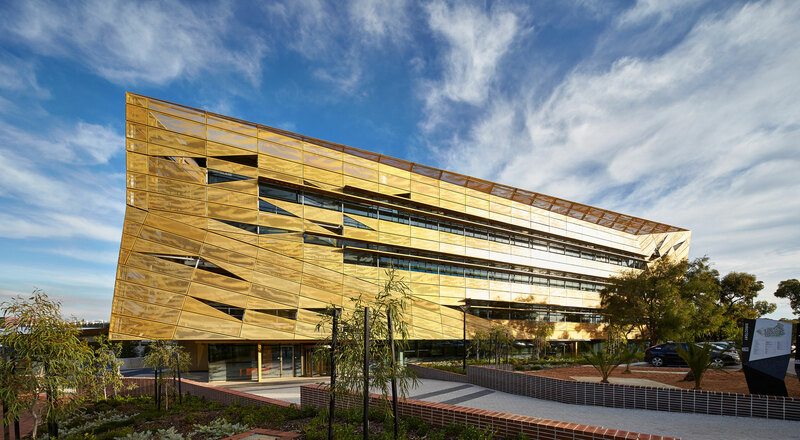 It is a shimmering, golden façade, demanding attention in Perth, western Australia. The project, reaching six levels, is named after the endangered white tailed black cockatoo, indigenous to the area. 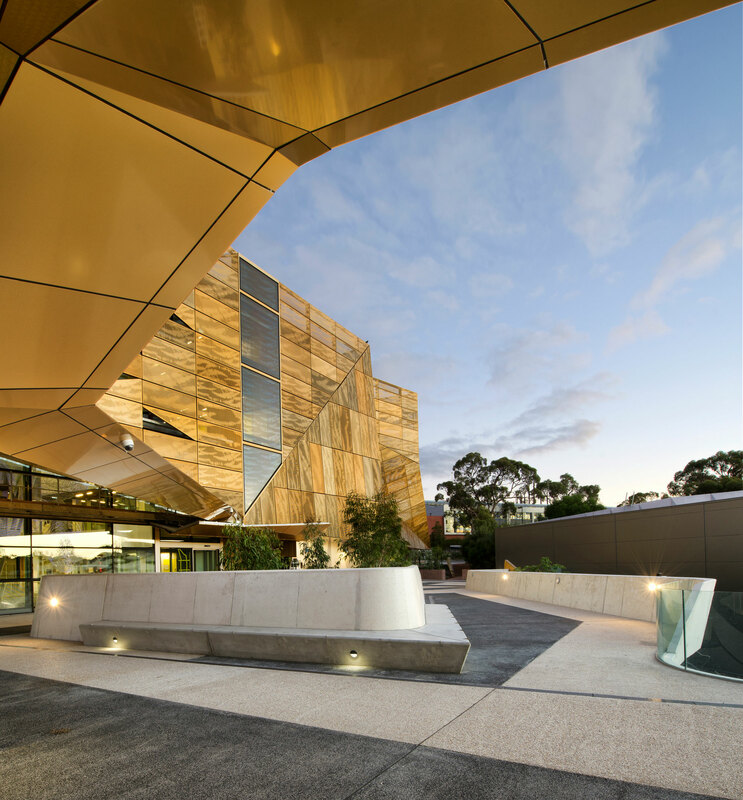 Ngoolark stands as an impressive civic building that has brought together the many functions the campus building serves. The building, designed by JCY Architects & Urban Designers, is detailed with a perforated aluminum metal shell and then, enveloped in 1,500 panels. The mastery of the design gives the building a three-dimensional shape from the street, while becoming completely transparent when viewed from the inside. 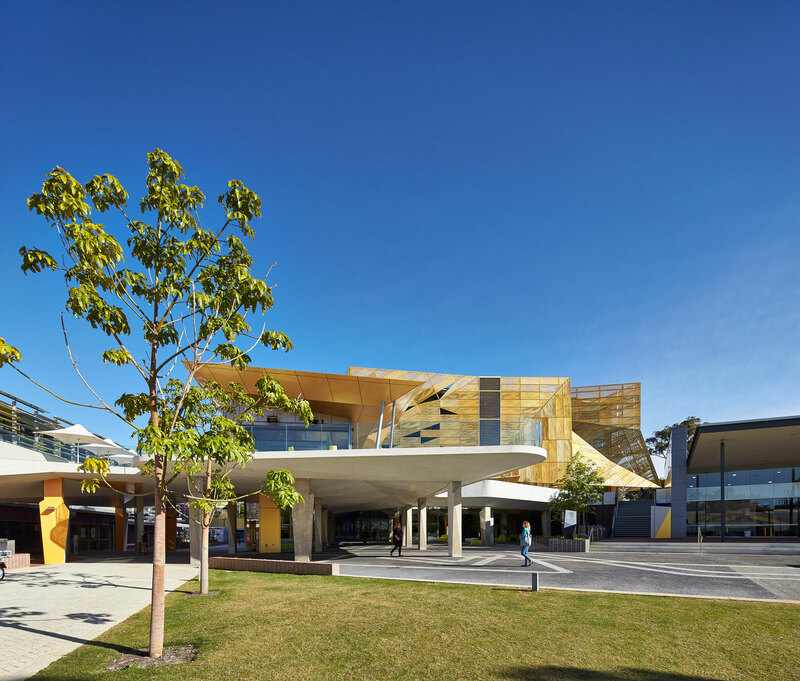 Alucobond panels can be seen used on the lower levels of the project in varying shades of Spectra Desert Gold, Bronze and Gold Metallic, fabricated by Denmac Pty Ltd. The Alucobond aluminum composite material (ACM) complements the remaining perforated exterior, with its similarly shimmering and light-changing abilities. One challenge the architects were tasked with achieving in designing the important infrastructure was to connect the numerous buildings and paths through the University, which had been left disconnected. The project was considered a huge success by providing a solution connecting the two primary administrative buildings. The project, as a whole, links the administrative buildings, the library, the lecture theater and all primary pedestrian links. The student services building fits in well with the master plan of the campus’ design. The interior features fresh open plans on every level, exposure to natural light from north to south, and exceptional collaborative work areas. In addition, breakout and social spaces are accommodated on each level. Even the office space is versatile and useful as classrooms, should the University’s needs evolve. Much of the inspiration for the design came as a result of a consultation with the local Aboriginal community and Kurongkurl Katitjin (ECU’s center for indigenous studies). Inspiration from the movement of water can be seen throughout, from the podium to the charcoal forum paving with its swirling white lines. 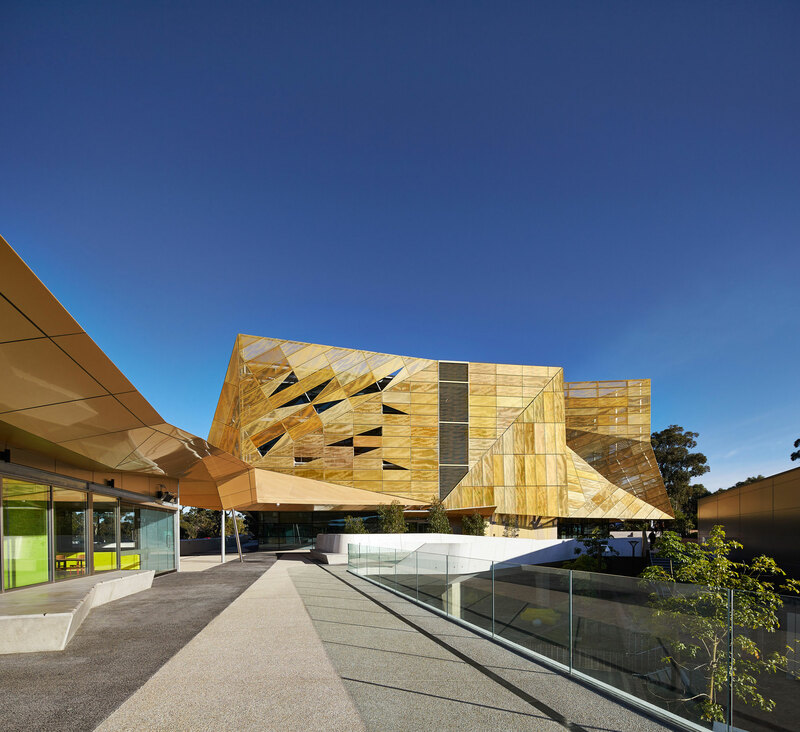 The innovative design of the gold perforated aluminum sun-shading exterior even mimics the feathers of the endangered cockatoo, Ngoolark. Y”all done good!!! Terrific design and great use of material. Can’t speak to the context or how well the building meets programmatic requisites, but from what I see in this article – Congratulations! This may become an architectural icon! I’m simi, editor at Archello architecture website in Amsterdam. We’d like to share your Ngoolark Student Services Building project with our readers. Could you share with us a press package for the project (texts, credits, plans, spec sheet and photos at 72dpi, 2600-3000px) ideally before the end of next week? We will place the project on your behalf on your Archello profile. Afterwards you will receive a link to the project. You can login to your account and make any changes you would like to the presentation.